In Austria, the anti-TTIP movement has a come a long way and turned public opinion against this vampire trade deal, one that cannot survive the daylight. Citizens’ movements have managed to reverse the balance of power against the interests of the multinational powerful interests. Although the reality is often forgotten behind the acronym, the four letters of TTIP represent a huge transatlantic free trade agreement. How can such a complex issue as a free trade agreement bring out the masses? It speaks volumes about TTIP that it became part of the political debate in Austria: during this year’s presidential election campaign, all candidates had to take a stance on it; no-one could avoid it. The role of President of Austria is a ceremonial one, yet TTIP became one of the hot topics of the campaign. How did that happen? Here we look back to the start of TTIP negotiations. From day one it was clear that the Greens would push for TTIP – the Transatlantic Trade and Investment Partnership between the EU and the USA, a follow-up project to the failed Multilateral Agreement on Investment (MAI) from the 1990s – to be rejected. In 2013, an intensive Austrian anti-TTIP campaign was launched, building a broad coalition of trade unions, environmental organisations and several NGOs, such as ATTAC. In Europe, mobilisation was most successful in German-speaking countries: while in 2014, 58% of the EU’s overall population was in favour of TTIP, in Austria, 53% was already opposed to it. This opposition can be traced back to an intensive anti-TTIP media campaign and Green information events held all over Austria, with even Austria’s most popular daily newspaper, the Kronen Zeitung, drumming up anti-TTIP feeling. By then it was clear how Austria felt about TTIP. Since then, attitudes across Europe have continued to turn against it. Resistance is spreading and the figures from Austria speak for themselves: 70% of Austrians are against the free trade agreement. In Germany, protests are growing, and in October 2015, 150,000 people took to streets against TTIP. Even in France, President François Hollande has threatened to end the TTIP negotiation. Three years ago, things looked very different: initially, people knew next to nothing about TTIP. Negotiations began behind closed doors, and all that the public was allowed to know was that there were negotiations happening. The EU’s aims, and concrete information about the content of negotations, were under lock and key, kept secret from the general public. By 2016, things had changed completely, and TTIP is close to being toppled once and for all. Thanks to controversial leaks by NGOs, politicians and newspapers, the public has learned about the negotiators’ extreme stances, and this has boosted resistance each time. Because TTIP is like a vampire: in the light of day, it can’t survive. Almost nobody now believes that the negotiations can be finalised under the Obama administration; TTIP, therefore, is breathing its last. But the effects it has had on society have remained. TTIP has become much more than a debate about chlorinated chicken and hormones in cattle. The agreement is a societal thorn in the side of dedicated pro-Europeans. Groups opposed to TTIP have liberated themselves as a self-aware movement borne by Europhiles, fully aware of European solidarity among regions, citizens and small business people. They stand side by side, calling clearly for European standards not to be withdrawn. This is an integrated movement which has succeeded in bringing people out onto the streets together and advocating in favour of something. People who have nothing in common other than these protests, and who may never have protested before, suddenly feel empowered to contribute something to this and to stand together. TTIP has come up against a Europe-wide debate. It is a debate about European identity, about European achievements, like the precautionary principle in consumer protection not being a given, and about the need to actively protect this principle. It is about European jurisdiction, patents, food quality, animal protection, social standards, and many other issues which affect daily lives. There is another key issue that came to the attention of TTIP campaigners: Investor State Dispute Settlement (ISDS). Often an integral component of other free trade agreements between the EU and other countries, it became a key word in the protest against TTIP and a symbol of the fear of the USA. Under ISDS, investors enjoy exclusive rights. Using extremely opaque non-governmental tribunals with exclusive judges, they can overturn national standards and overrule national and European law. Arbitration tribunals, historically, have been set up in countries with unstable legal systems, i.e. in places where democracy was under extreme threat because of a coup, for instance, with the threat of the independent judiciary being taken over. Arbitration tribunals are an emergency system intended to ensure that democratic foundations are adhered to. When embedded in a free trade agreement, their role is reversed: they tear up democratic foundations. Only investors have recourse to ISDS; citizens and domestic companies are categorically excluded. If a foreign investor considers its profits to be limited by democratically-validated rules like a national environment law, they can sue the country’s institutions for billions. And they are already part of the political reality, even in Europe; a few hundred exist in between EU Member States alone. Take the example of Schweighofer, a huge Austrian timber corporation that dominates the timber industry in Romania and is facing serious charges of illegal logging in dedicated conservation areas and of purchasing illegal timber. Romania wanted to strengthen its environmental regulations to bring an end to the corrupt practices in the timber industry. Schweighofer threatened to take Romania to an international court of arbitration. This danger was seized upon and painstakingly brought to light by the media, showing an obscure means through which corporations, especially US corporations, can use their special rights to obtain payments of billions of euros. So the anti-TTIP campaigners focused on ISDS and this was the European Commission’s downfall. Resistance to arbitration was so widespread that even the German Social Democrats would only sign the agreement under the condition of reforming the ISDS clause. Under the immense pressure, EU Commissioner for Trade, Cecilia Malmström, brought forward in 2015 a reform of the private arbitration process in the form of an international court of arbitration. It is doubtful, though, whether the US will agree to it. A clear political imperative has arisen from these developments: if we don’t want to be exposed to the force of private corporations protecting their interests, and if we ever want new environmental legislation on forest erosion or the banning of fracking, we must unequivocally reject such protections for investors. This seemingly huge agreement can be broken down into individual topics, conveyed with concrete examples and used as political leverage for civil society. This way, citizens can grasp the very real political effects of abstract treaties and agreements on their everyday life. If people have direct access to information about political concerns, they can build on this knowledge to act independently. This is how the anti-TTIP campaign has become an instrument for political emancipation and participation. The history of TTIP can serve as an example of free trade without democratic control coming at the expense of the vulnerable. Thanks to ongoing campaigns, people are now fully aware of that. It has succeeded in establishing a clear David versus Goliath balance of power among the general public: the powerful against the weak; corporations against individual citizens, consumers and workers. This hasn’t only succeeded in Europe: resistance to TTIP has also rebooted strong transatlantic exchanges. 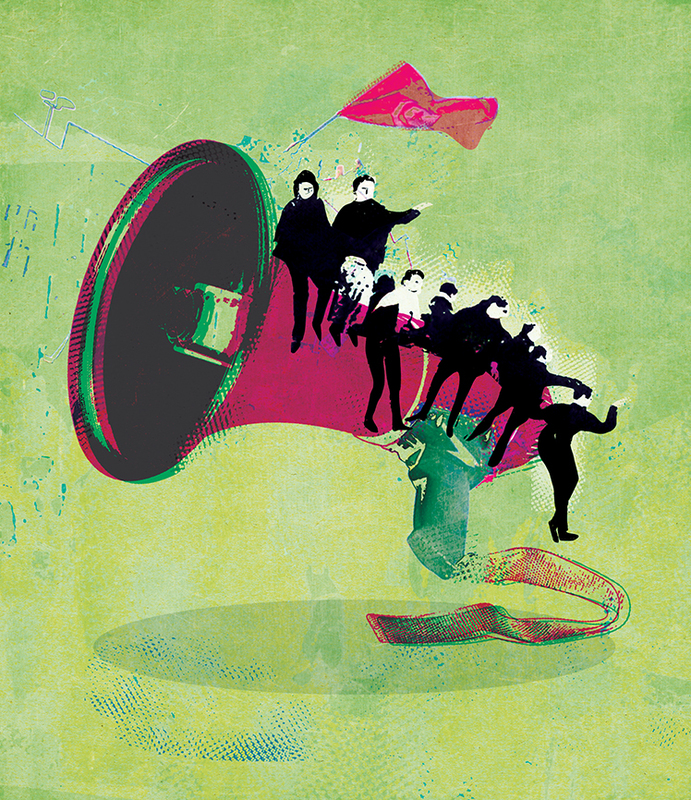 American trade unions and NGOs, armed with years of experience of the effects of free trade agreements, brought their protests and their information to Europe and networked with local activists. The consequences of NAFTA, an agreement between Canada, USA and Mexico, are now clear: almost none of the promises enthusiastic NAFTA supporters made in the mid-90s were kept. And today’s reality even looks at odds with promises: Mexico is actually in a worse position now than before it was part of the free trade zone. Hundreds of thousands of Mexican farmers are now out of a job due to a wave of cheaply produced American foods coming to Mexico. Food standards were dramatically lowered. Growth slumped while income inequality and crime rose. Before the agreement Mexico was self-sufficient, but now it has to import a tremendous quantity of its basic foodstuffs. The benefits vaunted for domestic small and medium-sized enterprises failed to materialise; only American corporations which invested in Mexico at the expense of Mexican jobs have profited from the agreement, exploiting their privileged position and suing for hundreds of millions of dollars through ISDS. After 20 years of NAFTA these very lessons were taken to Europe. Critics of globalisation, who have created a network across Europe and across national borders to campaign against free trade, were able to point to these examples. This awareness, however, means a battle is won, but not yet the war. The state of play at the moment is this: we are within touching distance of defeating TTIP. This much is clear. So clear, in fact, that while TTIP protests are still ongoing, some people are working on another way forward: while the spectre of TTIP still occupies the media and takes up attention, the Commission and the Council are still coming up with new free trade agreements with other countries. CETA, the free trade agreement with Canada, is already in the starting blocks, and is nothing more than TTIP by the back door. While the masses are still successfully fighting TTIP, CETA is being rubberstamped by the European Commission and will be voted on, firstly by the European Parliament in winter 2016 and then by national parliaments. In common with TTIP, CETA is a mixed agreement, meaning that it requires the agreement of national parliaments for national competencies. But a solution is at hand: now attempts are being made to gain “preliminary” implementation in the national parliament. This purported preliminary regulation covers the lion’s share of the agreement, i.e. investment protections. This means the parts of CETA rooted in European law could come into force before parliamentarians from all the Member States have voted on the agreement. There can be no question of this implementation being preliminary. The regulations could be set in stone over the course of years without the consent of parliamentarians, and currently there is no end in sight; in theory this “preliminary” period could go on forever. US businesses can then simply invest in Europe via their Canadian firms, of which there are already 41,000. If TTIP collapses and CETA happens instead, these businesses will go the long way round, through their neighbour, and sue European states via ISDS, through their subsidiaries. The plan that smoothens the way for a potential wave of lawsuits looks like this: just like TTIP, a private court of arbitration is established through which investors can sue. It’s a sophisticated idea. A wave of such cases could be set in motion across Europe shortly after CETA is approved. The danger that arises from CETA isn’t widely known relative to the dangers of TTIP, which can be traced back to an extremely targeted strategy. It’s worth repeating that the Council of the EU and the European Commission are rushing the agreement through the institutions, almost unnoticed. By using tricks like “preliminary” implementation, they can lever out national parliaments, and the powers that be hope that these deals stay quietly out of the public eye. Gradually, resistance to this will also grow. And let’s remember that when TTIP began, its aims were secret and nothing was at hand. With CETA, it’s different – despite all the efforts at secrecy. Now the Greens must succeed in turning all the attention and pressure that was built up together around TTIP onto its Canadian counterpart. Just as with NAFTA and TTIP, the battle lines are clear: this, too, is a case of big versus small. And the European civil society and citizens can only tackle the big together. This means patience, with a critical eye for free trade agreements that EU governments might thoughtlessly wish to make with other less economically developed countries, and for the effects of these, which could be devastating for Europe. TTIP has taught the anti-TTIP campaigners that even with such a big, vague thing like free trade agreements, a lot of citizens can be activated to join a protest. In this case it was crucial to break it down to some detailed and concrete aspects, like ISDS, and to raise awareness of the effect on everyday life. It is also the foundation for any follow-up protest against any free trade agreement in Europe.